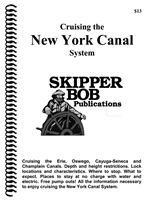 Cruising, navigation, and transit information for the (4) major canal systems that make up the New York State Canal System (NYSCS) including: The Erie Canal, the Champlain Canal, the Oswego Canal, and the Cayuga-Seneca Canal. One of the main purposes of the New York State Canal System (NYSCS) is to provide the mariner with a shorter inside route to the Great Lakes, the St. Lawrence Seaway, and the Finger Lakes Region of New York State. To provide you with an example: When using the NYSCS, the distance from New York City to Buffalo is roughly 305 NM. The next shortest route is about 1880 NM. So as you can see, it is quite a time saver not to mention costs. Included is information on the navigation season, transit permits and costs, buoyage system, charts, communications, water depths, speed limits, free mooring availability, NYSCS Notice to Mariners, distances, estimated transit times, lock information with photos, phone numbers, and waypoints, weather resources, and bridge clearances. Also included is the necessary information on the Federal Lock at Troy, NY. The New York State Canal System (NYSCS) began its life as the Erie Canal. Construction of the Canal began in 1817 and it opened for navigation on October 26 1825. During the same time frame, construction began on the Champlain Canal connecting the lower Hudson River with Lake Champlain. The Champlain Canal officially opened in September of 1823. The Oswego Canal was built to provide a connection to Lake Ontario which was bypassed by the original Erie Canal. Construction began in 1825 and (4) years later the Oswego Canal opened for navigation in the spring of 1829. The history of the Cayuga-Seneca Canal is a bit more complex, being built in short sections at a time. The first section opened in 1818 but only connected Seneca Lake to Cayuga Lake. The desire of local business men to have a connection to the Erie Canal prompted new construction of a section that would connect to the new Erie Canal. Construction of this new section began in 1825 and was opened in 1828. In 1905, New York State brought these (4) separate canal systems under one organization; the “New York State Barge Canal” as improvements began. Construction was completed in 1918. In 1992 the New York Barge Canal ceased to exist and the (4) separate canal systems reverted to their original names under the new "New York State Canal System." Today, the NYSCS is comprised of 57 locks, 16 lift bridges, and numerous free tie ups stretching over the entire 524 miles (843 KM) of the system, and we have broken them all out for each of the (4) canals. The navigation season for the NYSCS system normally runs from mid-May through mid-October with the standard hours of operation between 0700 and 1700 daily. A number of locks and lift bridges also have extended hours operating beyond 1700. These times are subject to change from year to year. Canal Passes, when required, may be purchased at many locations, but for those in transit, passes are most easily obtained at the first and last locks of each of the canal systems. Lock E-2 and E-35 on the Erie Canal, C-1 and C-12 on the Champlain Canal, O-1 and O-8 on the Oswego Canal, and CS-1 and CS-4 on the Cayuga-Seneca Canal. You can read more detailed information regarding recreational passes and regulations by reading the official NYSCS Recreational Pass Information here. Toll schedules and cost of permits can be found in the sidebar to the right. Cayuga-Seneca Canal - Red markers are kept to starboard between locks CS1 and CS4 when south and westbound. Champlain Canal - Red markers are kept to starboard between locks C-1 and C-12 when northbound. (North of C-12 the buoyage system reverses). Erie Canal - Red markers are kept to starboard between locks E2 and E35 when westbound. Oswego Canal - Red markers are kept to port between locks O1 and O8 northbound. The buoyage systems reverses between Lock O8 and the open waters of Lake Ontario. A single chart booklet, (NOAA Chart #14786), provides coverage of the entire canal system including the Cayuga-Seneca, Champlain, Erie, and Oswego Canals. An exception to the chart coverage occurs on the far western portion of the Erie Canal, west of Lock E28 to the Niagara River, where no chart coverage exists. The minimum project depths available throughout the New York State Canal System range from 12’ to 14’ with depths over the lock sills typically being slightly less than channel depths. The un-charted section of the Erie Canal, west of E28, has project depths of 12’ to Tonawanda, NY and the Niagara River. Vertical clearances throughout the canal system present the biggest challenge to many transiting mariners. These clearances range from 15.5’ to 21’ depending on what section of the canal system you are transiting. The limited clearance heights are of most concern to sailing vessels and larger powerboats. All vessels transiting the NYSCS system should be aware of these height restrictions and ensure that their MHH’s will allow for safe passage. For those that require their masts to be stepped or un-stepped, we have a list of known marinas and contact numbers in the vicinity of the NYSCS where this service is offered. Stepping and Un-stepping Your Mast. All lockmasters and operating bridgetenders throughout the entire New York State Canal System maintain a watch on VHF channel 13. Phone numbers of each lock can also be found in their respective canal sections. All lock chambers on the canal system are 328 feet long and 45 feet wide and are designed to accommodate vessels up to a maximum of 300 feet LOA and a 43.5 foot beam. New York State Canal System lock chamber waypoint’s for the Cayuga-Seneca, Champlain, Erie, and Oswego Canals in PDF format are available for download in their respective sections. "Vessels may moor at a Canal Corporation owned dock or terminal up to 48 hours in a calendar month. Such mooring is free of charge, though services provided at the facility, such as electric, water and pumpouts, may have a charge associated with them. Vessels wishing to moor in excess of 48 hours must apply for a permit from the Corporation. Unless extenuating circumstances exist, such permits are usually granted only to commercial and other non-recreational vessels." Many of the towns and communities along the New York Canals have made significant improvements to the terminal walls within their boundaries. Installing floating docks, power, water, restrooms, and other amenities. Some have elected to charge a reasonable fee for these services while others offer them free and simply ask that you support their local businesses. In most cases, if you elect not to use these additional services, you are still allowed to dock for free. There are exceptions to this rule however. Lock approach walls can be another option for free overnight dockage with no amenities. You should check with the lockmaster if you are considering this; there are a few lock approach walls that can be hazardous and may not be used. You may also want to consider your direction of travel when deciding whether you want to spend the night on the up or down stream side of the lock. Where NYS navigation law dictates it is 5 mph. On open lakes, there is no speed limit. On rivers 45 mph is allowed. Land cuts / rock cuts - 10mph. Remember that the NYSCS can limit speeds below those authorized by law. Speed limit signs are posted at various locations throughout the canal system including every lock indicating the maximum speed limit ahead for that section of the canal. The standard caveats apply throughout the NYSCS; watch your wake, practice good seamanship, and make liberal use of that most important piece of safety equipment you carry onboard - "Common Sense." A listing of speed limits for each canal can be found in their respective sections and are available for viewing or download. One of the most common questions that I hear is: “How Long? “ Presuming, that you are simply looking to transit the canal system to get to the other end as rapidly as possible, it really will depend on the speed of your vessel. The Erie Canal from Waterford, NY to Tonawanda, NY can be done in 36.3 hours or basically slightly more the (3) days. If you are bound for Lake Ontario, then Waterford, NY to Oswego, NY can be done in as little as 23.6 hours or just under (2) days. If you happen to be headed north to Lake Champlain, you can do Waterford, NY to Whitehall, NY in 7.5 hours or a little more than (½) a day. The Cayuga-Seneca Canal from Kipp Island (at the Erie Canal junction) to Lake Seneca will take you 2.8 hours. For most full displacement vessels able to cruise between 7 and 10 knots, the times will be significantly more. A breakdown of speed vs. time can be found in each respective canal section. Finally, the numbers shown above while possible, do not reflect reality. When you factor in all of the possible delays, including: locks, operating bridges, no wake zones, other vessels, etc. the full length of the Erie Canal will probably take about 5 days, the Oswego Canal – 7 hours, the Champlain Canal 10 hours, and the Cayuga-Seneca Canal about 5 hours. The latest navigational information can be found at Canal System Notice to Mariners. Anyone planning to transit the canal system should check these notices for last minute information on hazards, restrictions, and closures. Running for 17.3 SM (15 NM) south and west from Kipp Island, NY at the Erie Canal Junction, to East Geneva, NY at the entrance to Seneca Lake. Running north for 60.7 SM (52.8 NM) from Waterford, NY to Lake Champlain at Whitehall, NY. Running north for almost 23.9 SM (20.7 NM) from Three Rivers Junction in the vicinity of West Phoenix, NY to Lake Ontario at Oswego, NY. Running west for 335.7 SM (291.7 NM) from Waterford, NY to Tonawanda, NY at the Niagara River. The 2019 navigation season has been established. Conditions Permitting, the entire canal system will open for navigation Friday May 17, 2019 at 0700. The Operating Schedule can be viewed below.